If you know the history of Halo: Combat Evolved, you know it was a long road before it found it’s way on to the Xbox as a launch title back in 2001. The game started as a bit of an RTS hybrid for the Mac, eventually became a first person shooter for the PC, and then never saw the light of day on either platform as Microsoft bought Bungie and made the game an exclusive for it’s console launch. Ten years have gone by and Halo has made its mark on console gaming by becoming an absolute juggernaut in the market and a series worth billions of dollars. So it should come as no surprise that the game that started it all has already been remade in Halo: Combat Evolved Anniversary. Make no mistake, Halo Anniversary is the exact same game you played on your Xbox all those years ago. It’s not so much of a remake as it is a remastering. The most obvious update are the graphics, which have been completely redone for the entire campaign using Halo Reach’s engine. The result is an absolutely gorgeous game with some really great effects. When Halo was released it was lauded for its graphics, which of course now look dated. 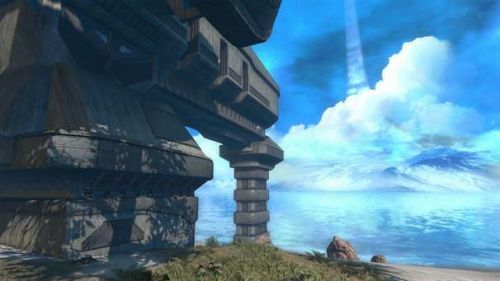 But when you set foot on Halo for the first time, just like when you played the game all those years ago - you’ll be wowed by the huge vistas, bold colors, and of course Halo itself extending into the horizon. If you want to remember what it looked like before, simply press the back button on the controller to switch to classic graphics, and you can see just how long ago 10 years really is. But the graphics aren’t the only asset in the game was updated - all of the music in Halo Anniversary has been re-recorded in a fully orchestrated version that sounds richer, fuller and more familiar to those that have played the recent Halo titles. In fact, a lot of audio has been remastered bringing a better sense of your surroundings thanks to excellent use of surround sound. Perhaps my personal favorite audio tweak are some of the new gun sounds. My personal favorite are the new pistol and sniper rifle sounds - both sound as deadly as their effect on the Covenant actually are. There’s little touches too, like the sound of the rockets being loaded into the chamber in the Rocket launcher that lets you know 343 paid attention to detail with not only the graphics, but the sound. The final, almost superfluous change, deal with the Kinect. If you have one you can call out commands like “grenade” or “brightness up.” Why? I’m not quite sure - but it’s there if you wish. Like I said earlier, the campaign is completely identical to how you remember it. Enemy placements, level design, and cut scenes all play out exactly as they did before. So much of the core game remains the same that the same loading zones occur like you remember, every turn of that hallway in the Assault on the Control room - yeah, still a loading hiccup there. I was a bit surprised at just how different things felt compared to the recent Halo games. 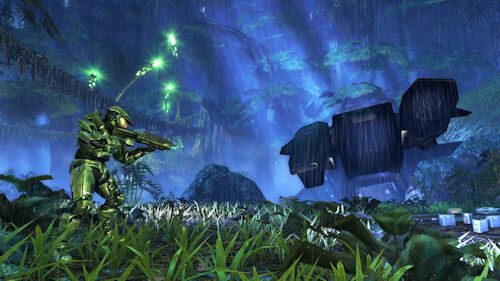 Halo: Combat Evolved’s gameplay is more in your face. You’ll find yourself pushing forward faster, meleeing Covenant more often, and rarely cowering behind cover while your shields regenerate. Master Chief jumps higher, defies gravity, and deals with the Covenant in a way that I don’t think was captured quite right in the later games. It’s good to see the series had evolved, but it also reminded me just how much I liked Halo. The dreaded Library level is still as brutal and long as you remember, though the Flood are much more menacing looking - if not frightening at times. 343 seems to have mixed up the texture work a bit too, adding in some nice lighting effects and colors to take away from the boredom that was the endless hallways of gray. I found myself constantly switching back and forth between classic graphics at points like these in the game just to see how far it’s come.